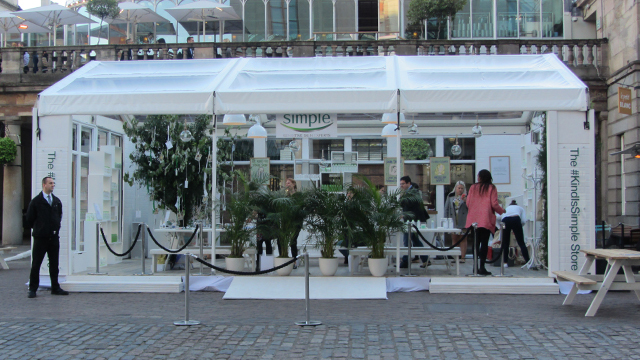 I was lucky enough to attend the Simple “Kind is Simple” Store preview in Covent Garden in London on Thursday evening, as a Stylist magazine reader. It’s a cute little pop up store where “kindness is currency”. 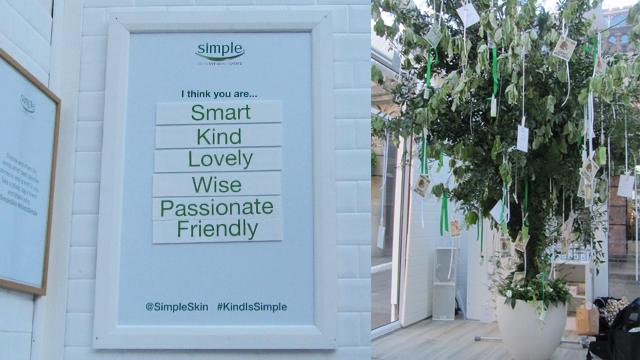 In other words, to receive Simple skincare goodies, you perform a kind act and publicise it on social media using the hashtag #kindissimple, rather than paying with sterling. There were several ways to be kind and I tried them all. I posted my efforts on Instagram and Twitter. You could describe someone you know using positive words and sticking them on a board, send a positive tweet, create a piece of art to give as a gift or something else as suggested on the kindness tree. 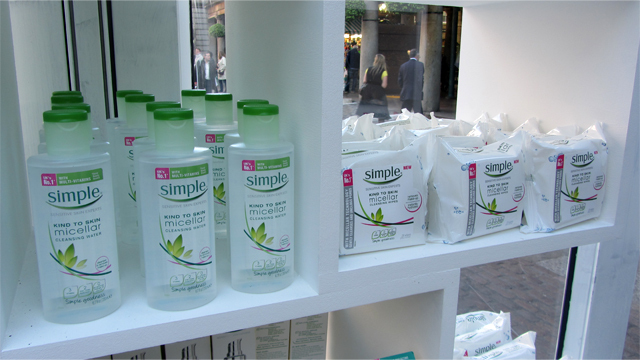 As for the skincare, I learned about Simple’s micellar water and micellar water cleansing wipes. I was quite excited about these as I love cleansing water and I am always on the search for some decent cleansing wipes. Simple micellar water is triple filtered to remove as many nasties as possible and it contains glycerin to lock in moisture so skin is not left feeling tight after makeup removal. This micellar water is also used in the wipes. 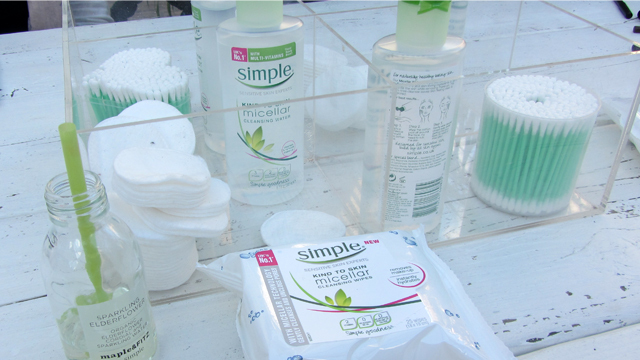 As with other Simple products, there’s no added fragrance or colour which is why it is great for sensitive skin. I don’t really like using scented products on my face so this is a great option for me. On a quick test on my hand of both the wipes and the water, my skin felt clean and cool. So far so good. Hopefully I’ll get around to doing a full review as I received a full sized micellar water and packet of micellar cleansing wipes. 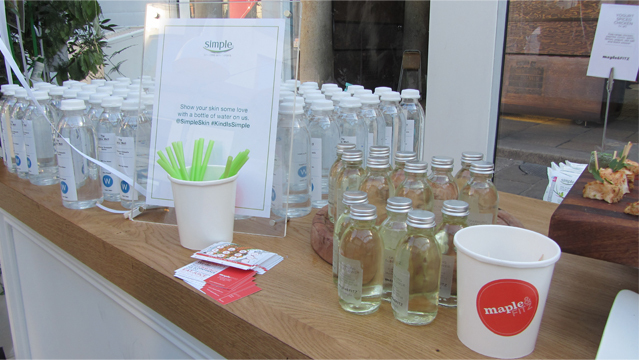 You can visit the store today on its last day, 22nd May, in the Covent Garden piazza at the Russell Street end. Have fun! Next PostNext Make-up is supposed to be fun!